SAFER, EASIER PAYMENTS ON GUMTREE. Have a bike collecting dust? Looking for a pre-loved couch? Whatever you're looking to buy or sell, do it locally and more securely with PayPal on Gumtree. Download the Gumtree app and log in or sign up, then link your PayPal account. Post an ad or browse the listings. Meet up and confirm the sale in person. The seller then requests payment in the Gumtree app and buyers pay right away. 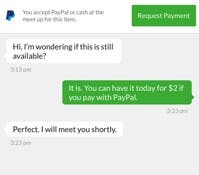 Why use PayPal on Gumtree? Let’s face it. Carrying cash is nerve-wracking and sharing your bank details can be risky. 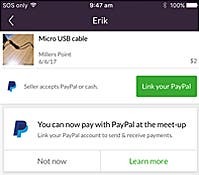 Keep yourself safer by paying with PayPal on Gumtree. All payment details stay securely encrypted and, if you receive an unauthorised payment for a Gumtree sale, we’ll help you get your money back. Meet up with people in your local area and inspect your purchases before completing the transaction so you know exactly what you’re paying for. Once you’ve met face to face and agreed on the price, simply enter or confirm the amount the in Gumtree app and click to complete payment. Calculated based on our standard domestic transaction fee of 2.6% + $0.30. 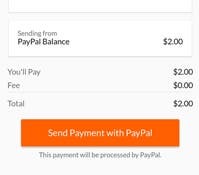 Discover an easier way to pay and get paid.